I’m fresh from the screening of The Amazing Spider-Man 2 I went to -at the time of starting writing at least- and I must say I’m pleasantly surprised with how this all turned out. Not saying I didn’t have any issues with it but we’ll get there. I’ll do my best not to spoil anything that wasn’t already in the spoiler filled trailers. 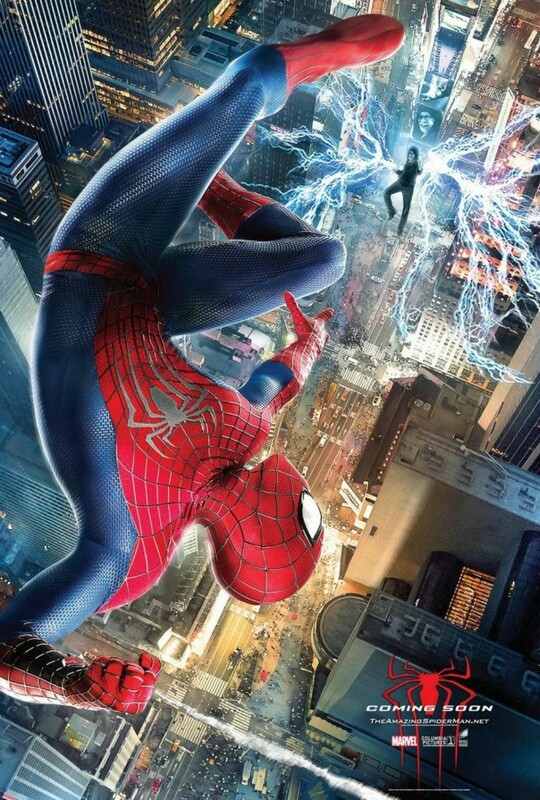 The story picks up an unspecified amount of time after the first movie -there’s a flashback section opening the film that reveals how and why Peter’s parents died- and Spider-Man has become one of New York’s fixtures, he swings in to fight bad guys and save people before swinging off- punctuating his time with cheesy quips as he does. An action sequence involving Paul Giamatti’s Alexsei Sytsevich serves as the first major set piece as Spidey tries to stop him from trying to steal plutonium, not sure you could get a more clichéd thing for a bad guy to steal. Of course Spidey stops him and catches the criminal but that’s only the start of his troubles. During this sequence he saves the life of Jamie Foxx’s Max Dillon who proves to be fairly mentally unbalanced pretty quickly. There’s a particularly creepy scene where Dillon is living out a fantasy life where Spidey is his best friend, honestly it has to be seen to be believed. Which brings me to Electro and his use in the film. He was ok but merely ok, I liked the setup of him feeling outcast by those around him and therefore feeling invisible. He has no friends and is underappreciated at his job so initially he’s relatable. It’s the moments of overt weirdness that bring him down though, he compensates for his troubles in such insane ways that makes it difficult to sympathise with the character. When he becomes Electro he goes into full cartoon villain territory -short of a few maniacal laughs- which makes him less believable in general. I was expecting a sympathetic villain based on the trailers but that’s not what we get here. Electro is only one small piece of this massive tapestry. Elsewhere we have Harry Osborn (Dane DeHaan who has returned from boarding school to see his father before he dies. Harry is an old friend of Peter’s who left 8 years prior to the opening of this film and has come back to inherit the company. DeHaan is excellent in the role, playing a much more sinister and calculating version of the character than James Franco in the Raimi series. His interactions with Andrew Garfield’s Peter Parker are very well written and the two actors bounce off each other well. The character suffers from the same issues as Electro though -he too descends into cartoon villainy territory and he does have the maniacal laughs. The Green Goblin literally appears seconds after Electro has been dealt with and what should have been an entire film’s worth of story is dealt with in only a few minutes. I was actually reminded of Venom in Spider-Man 3 when this happened, this is almost as brief. The real heart of the story comes from Garfield’s Peter Parker and Emma Stone’s Gwen Stacy. Considering that they are a couple in real life it’s no surprise that they have lots of chemistry here. When they are on screen they’re superb to watch. I was getting annoyed at the on and off nature of their relationship throughout the film but their scenes together were great, I could honestly have watched them all day. Gwen isn’t just a simple prize for the bad guy to kidnap, she’s far more layered than that. She’s a genius, she’s compassionate, resourceful and knows what she wants from life. There are many moments in the film where she calls Peter out on things that he’s doing and helps him with his heroics. Sally Field’s Aunt May was really well done I thought, she is a strong and well developed character but she seems a little stupid in the fact that she’s completely oblivious to her nephew’s extra-curricular activities. She has a lot of evidence to make certain assumptions based on what goes on here. Field works well with Garfield in the scenes they share together and she plays an excellent mother figure here. All over the place is actually a fair description of this film as a whole. There’s large chunks of time spent on stories that could be saved for a later film and as a result the story feels disjointed. I wasn’t sure if Electro’s villain story was the main one or if it was Harry’s as the film seemed to spend equal time on both which made each of them feel somewhat hollow for me. When the film tries to get back to what it should be about, it’s great but it spends too much of the considerable runtime cutting to unnecessary world building scenes. I’m also wondering if the cartoonish nature of the visual effects was a choice since they looked about as bad throughout the film. If it was the intention then mission accomplished but they lifted me out of the film a bit. It reminded me of the Kirk Alyn Superman serials where he would be replaced by a cartoon whenever performing any Superman stuff. It makes it hard to get invested in the action in this film when none of it feels remotely real. Considering the film’s budget there’s no real excuse for it looking so bad these days. I liked it but didn’t love it. I really enjoyed the relationship between Peter and Gwen and the action scenes were entertaining to look at. The villains were laughable in how unrealistic they were -yes, even for a comic book movie- and the story was all over the place. Basically the thing was a mess, an entertaining one but still a mess when all is said and done.